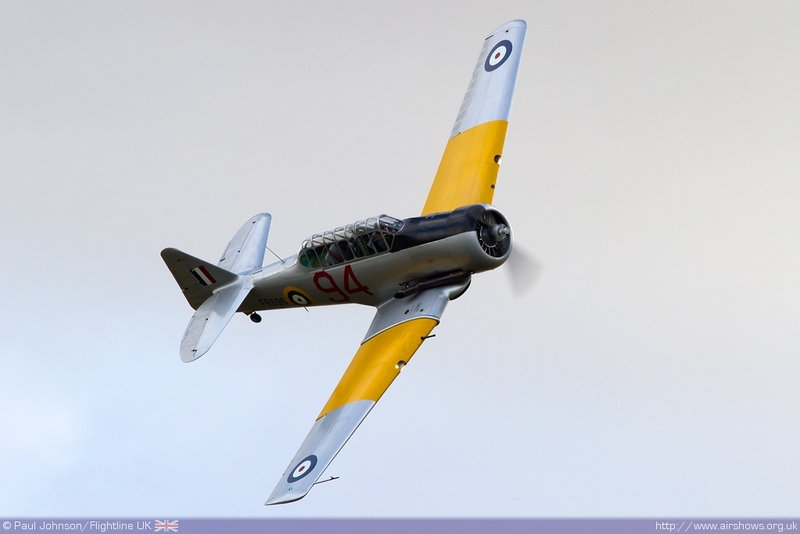 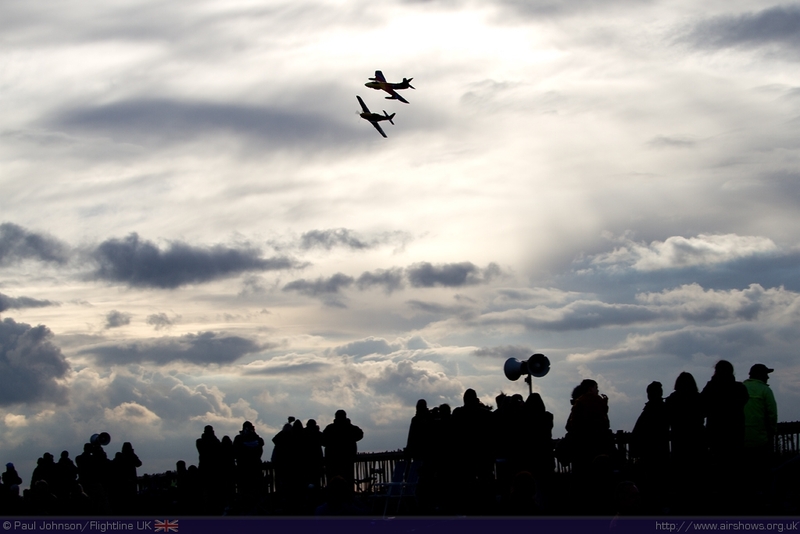 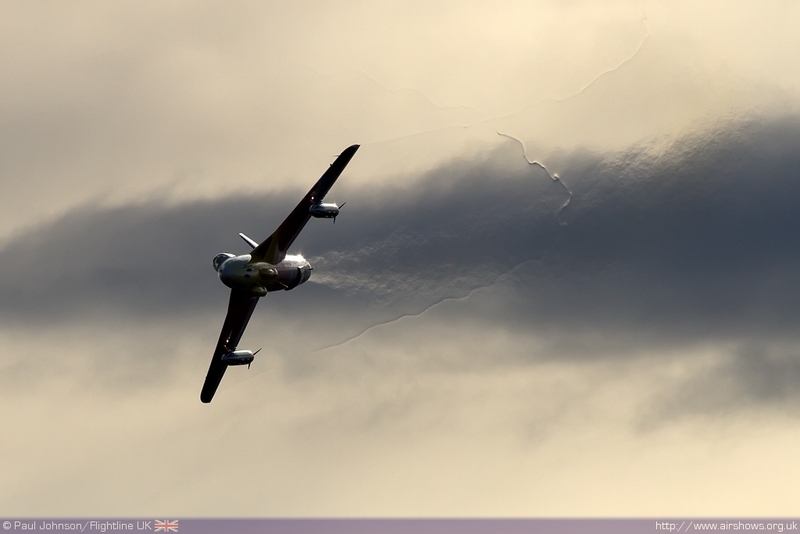 The UK Airshow season traditionally comes to a close at the Duxford Autumn Airshow. 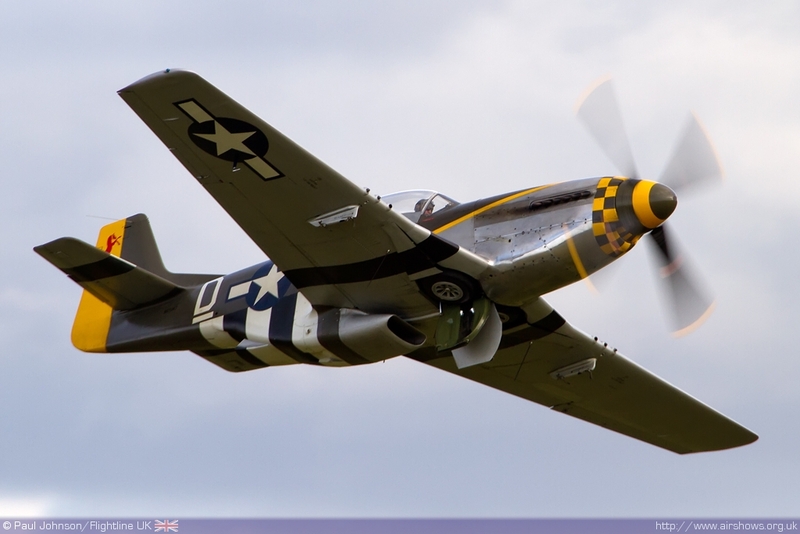 This year there was no major theme to the flying, though the display did mark the 70th Anniversary of the Merlin powered P-51 Mustang variants as well as a number of farewells. 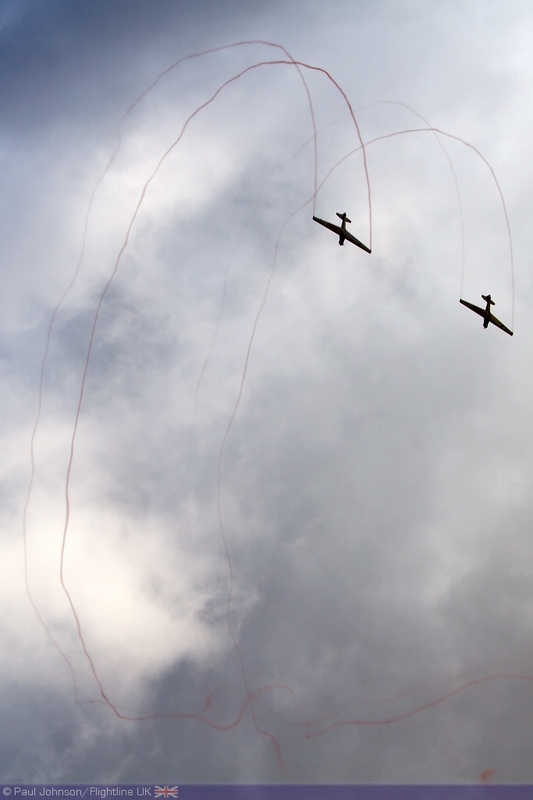 The flying displays were very varied covering with a number of historic and modern types set against some autumnal skies. 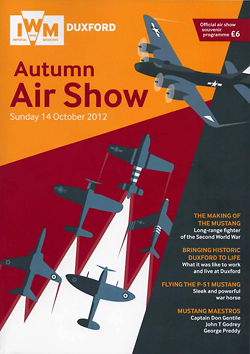 After five and a half months, Duxford’s Autumn Airshow brought the curtain down on a spectacular airshow season. 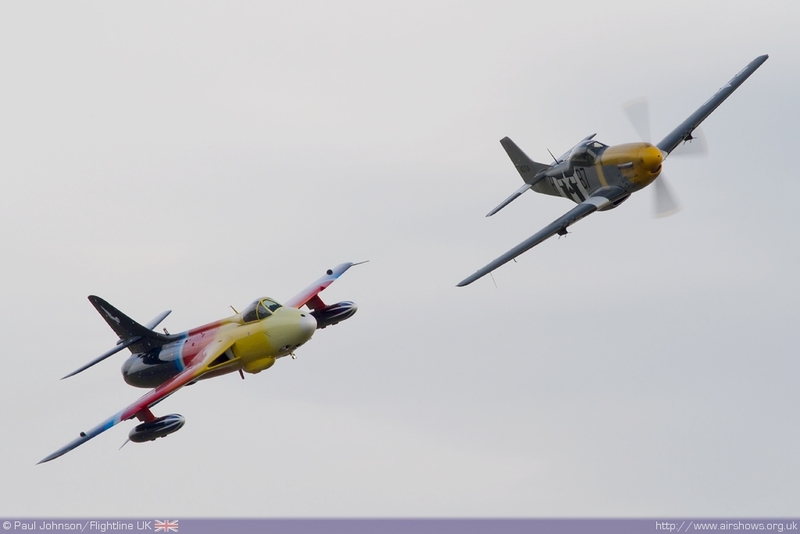 Duxford itself has had a wonderful year of airshows with many highlights. 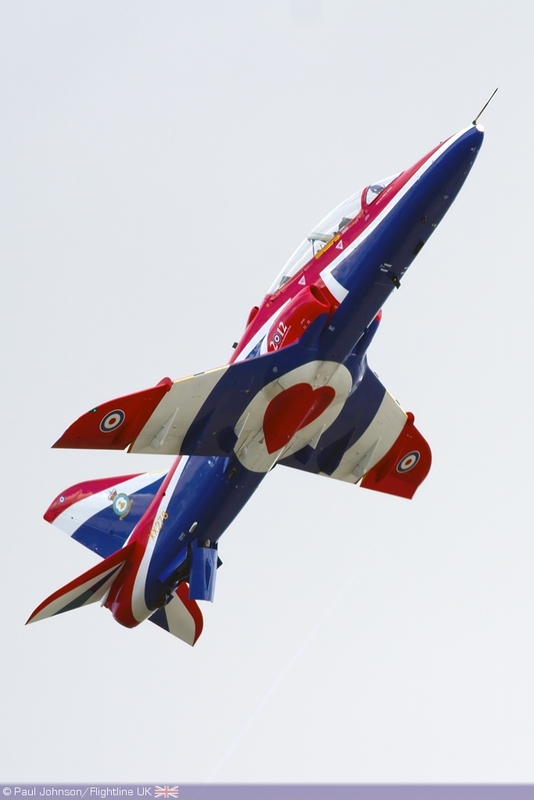 The Jubilee Airshow opened the year in style with a wonderful series of displays relating to Royal Flying as well as spectacular display from the Belgian F-16. 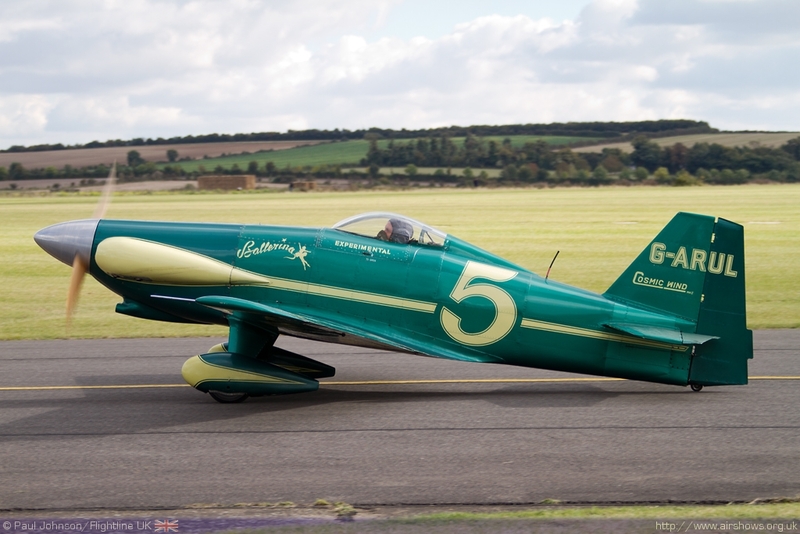 Flying Legends was once again the world’s best warbird show with a debut performance by the Fighter Collection’s P-47G Thunderbolt and who could forget the wonderful Albatros DVa and RE8 at the September show. 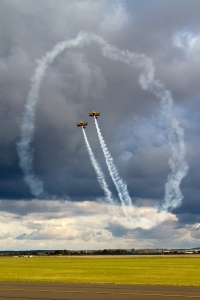 In many respects, such high standards meant the Autumn Airshow had some very hard acts to follow and on paper it may have seemed a very low key line up. 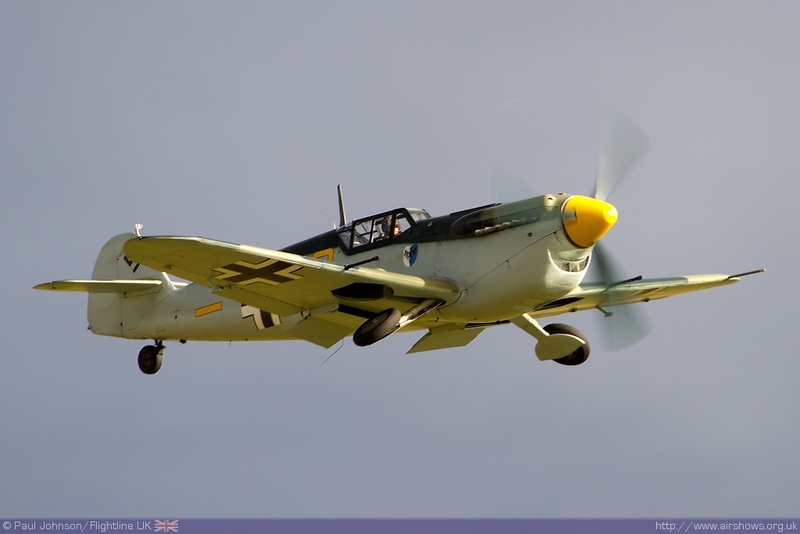 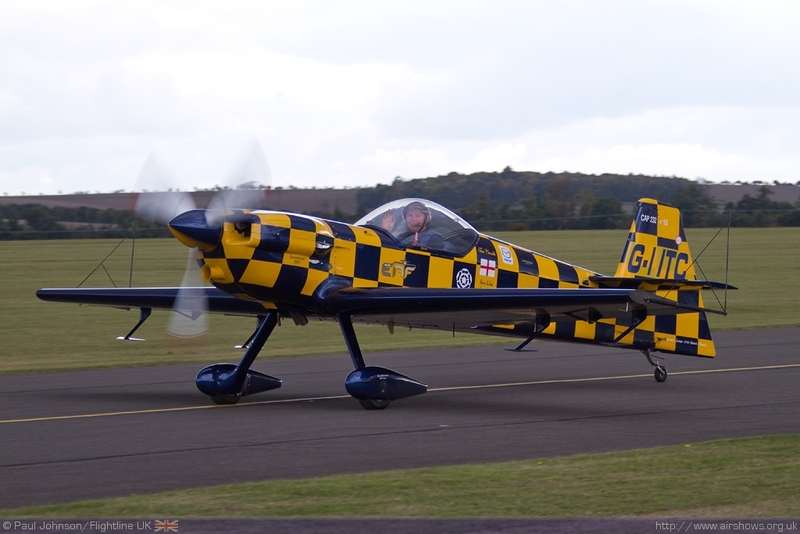 However, the Autumn Airshow was a very significant and enjoyable event for a number of reasons; not least some of the fond farewells the show included as well as some very fine flying. 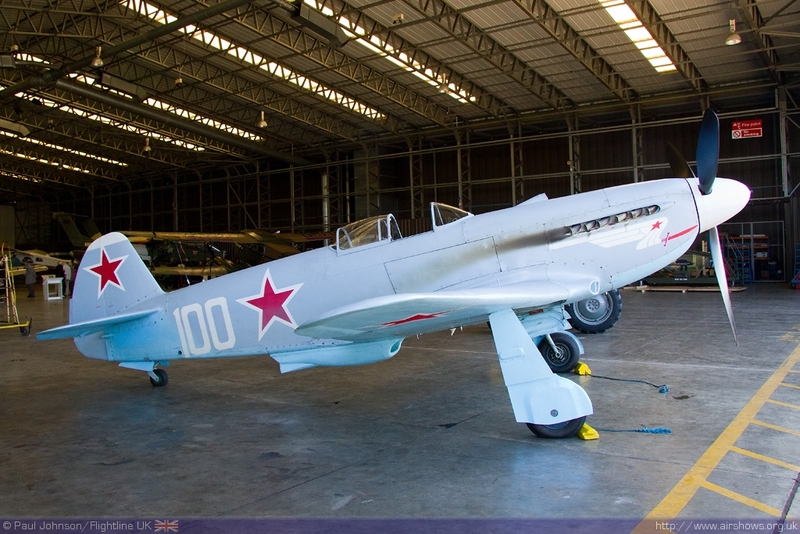 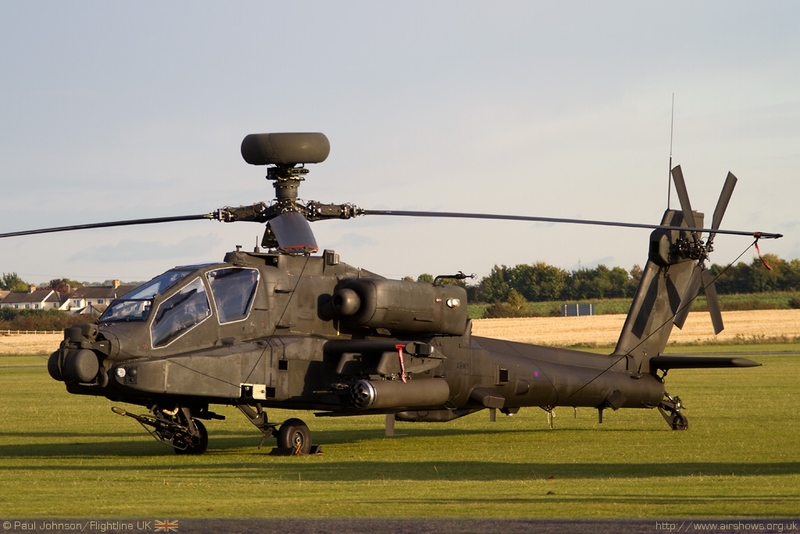 On the ground amongst the static aircraft were a Yakovlev Tak-3M and a British Army WAH-64D Apache AH1. 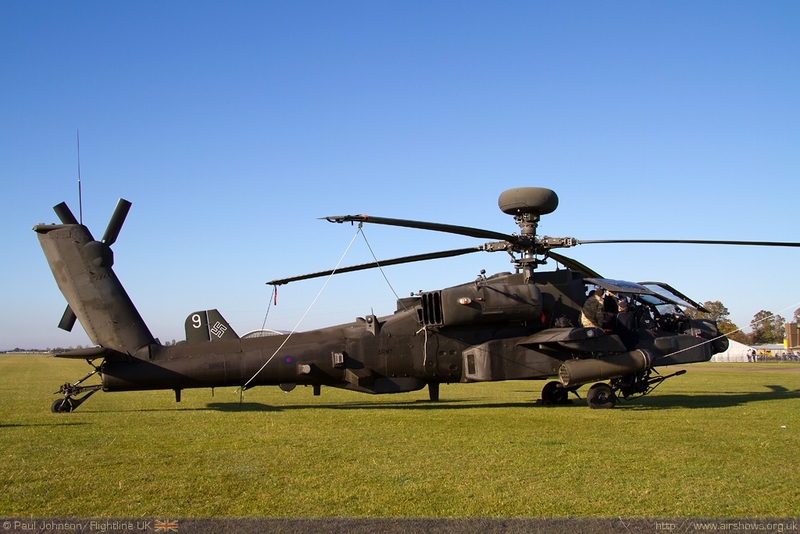 The Apache had been due to fly, but one the display crew became unavailable at the last minute. 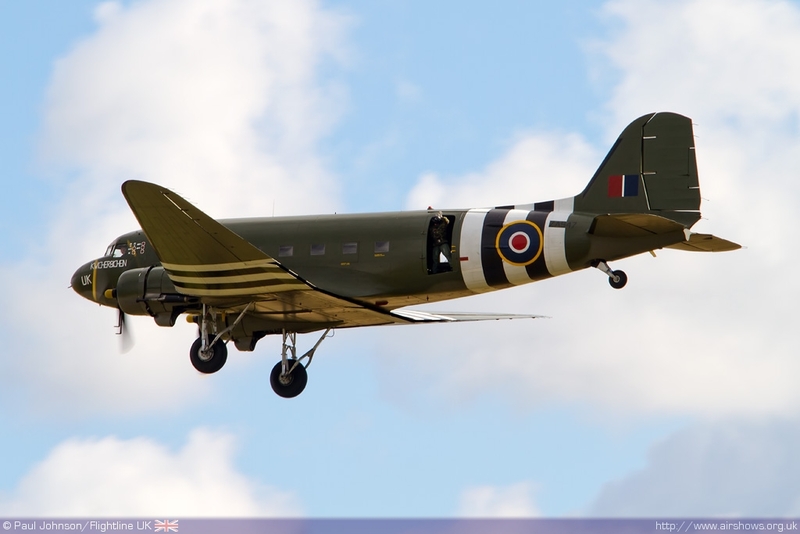 The show was opened in fine style by the final Battle of Britain Memorial Flight display of 2012 with the flight’s Douglas Dakota III. 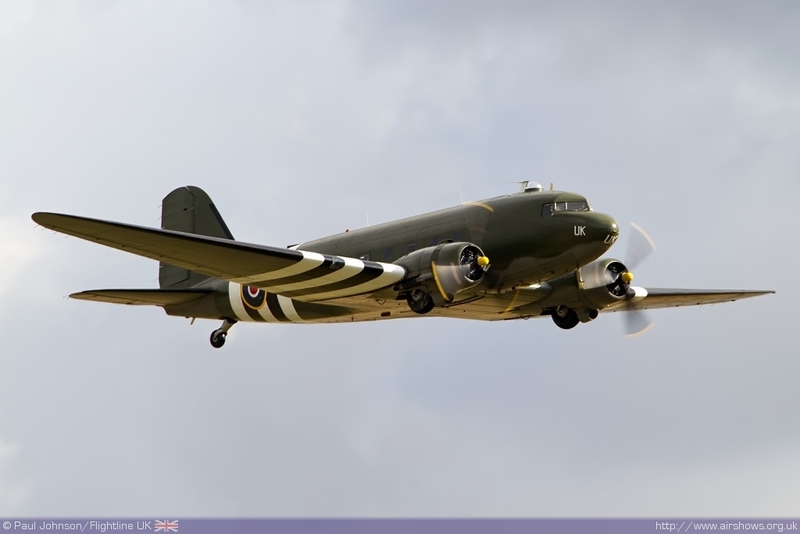 The Dakota is a seldom seen aircraft on the circuit and is wonderfully presented so it was great to see it at the closing show of the season. 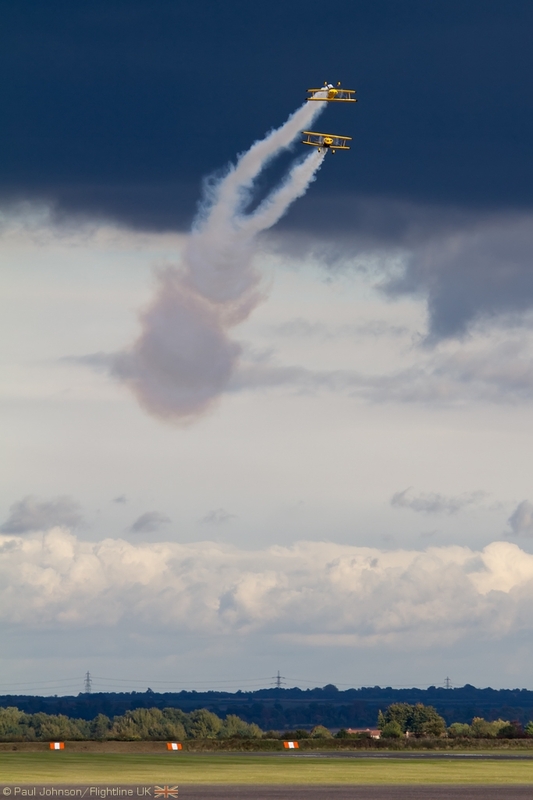 The next display was a total contrast going from the large DC-3 to the tiny Cosmic Wind flown by TFC’s chief pilot, Pete Kynsey. 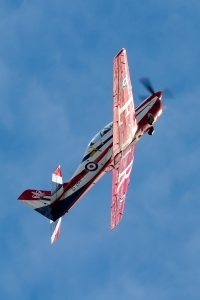 Pete’s aerobatic displays is the Cosmic Wind are always a delight with multiple rolls off the top of half Cuban eights and even 16 point hesitation roll are trademarks of the routine! 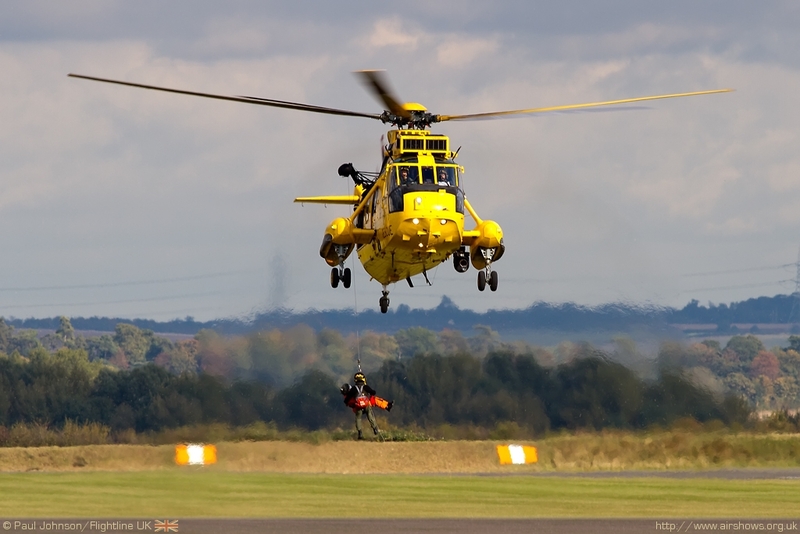 2013 will see some big changes to military displays and Duxford saw a couple of significant ‘lasts!’ The first ‘last’ was the final ever duo display by the Royal Navy Black Cats Helicopter Display team. 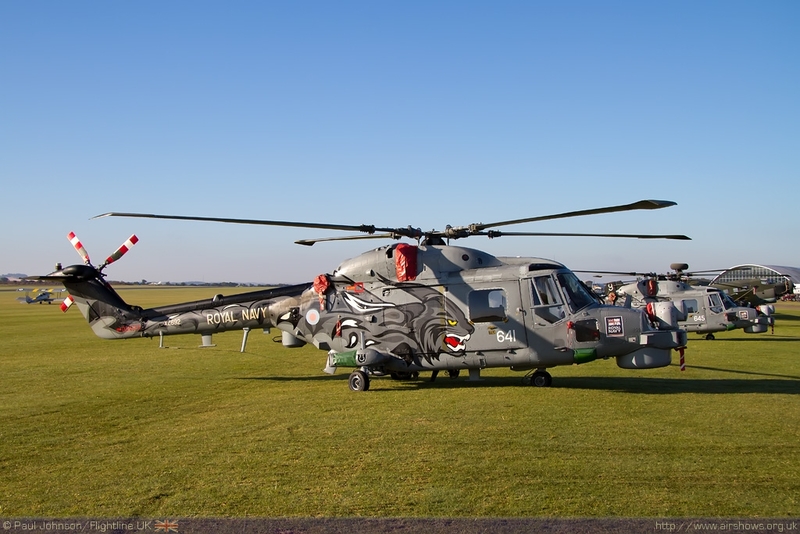 We are entering a period of major changes for UK military helicopter operations with the introduction of the AgustaWestland Wildcat. 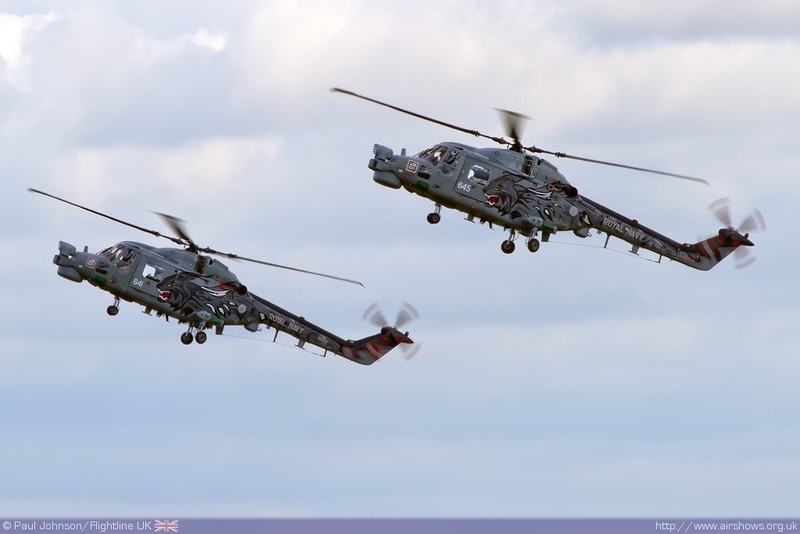 As a result of the Wildcat being brought into service, the existing Lynx force is slowly being drawn down. 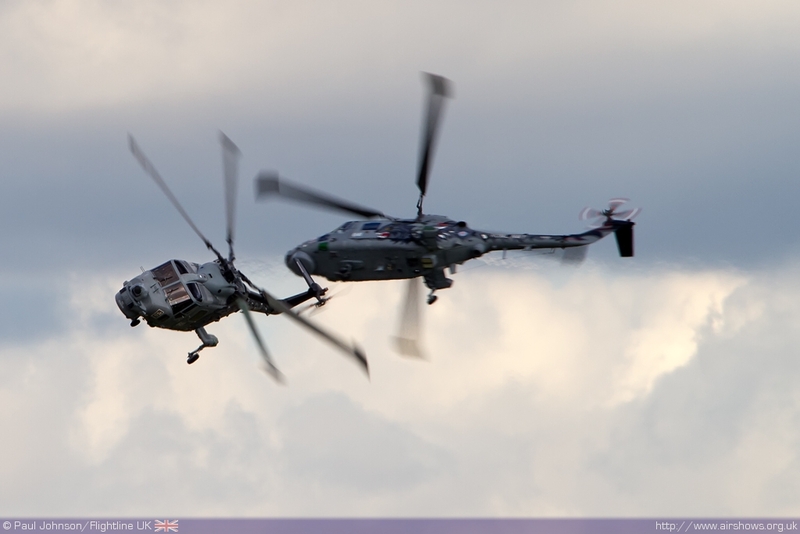 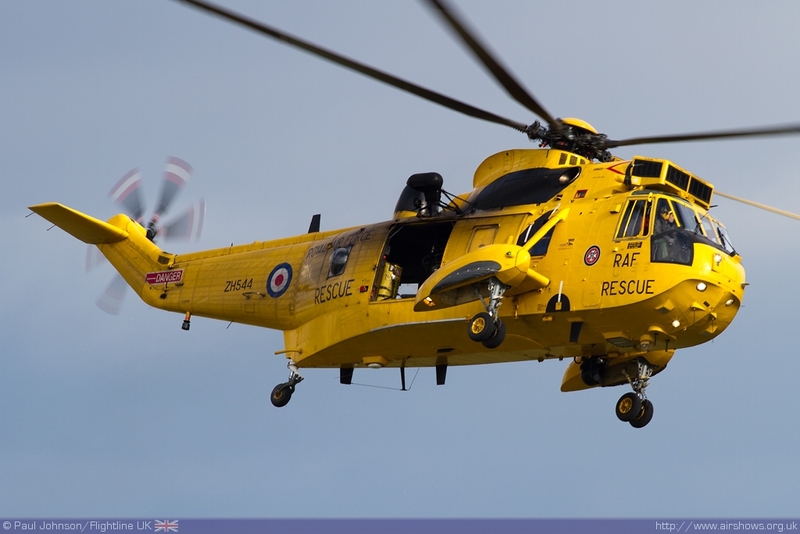 2013 will see solo Lynx displays from the Black Cats (702NAS) and 815NAS. 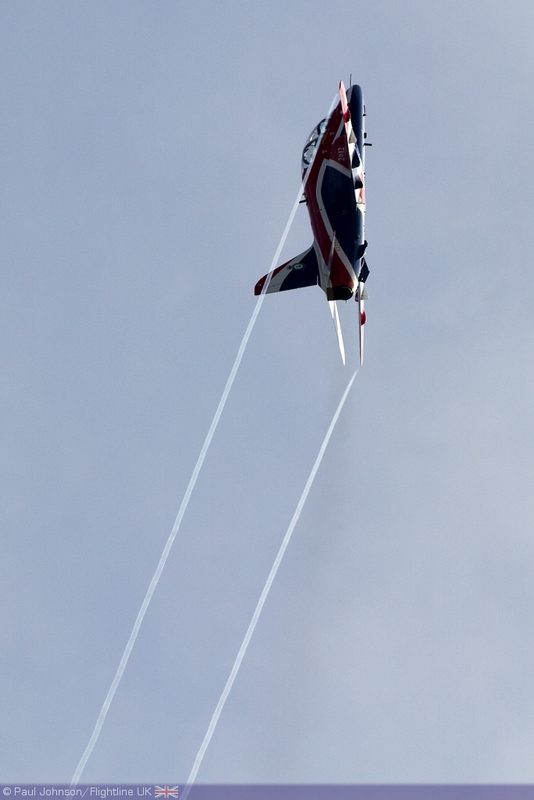 The Black Cats have been superb supporters of airshows since the days of the Lynx pair and it is shame to see their precise formation and synchronised flying disappear from the scene. 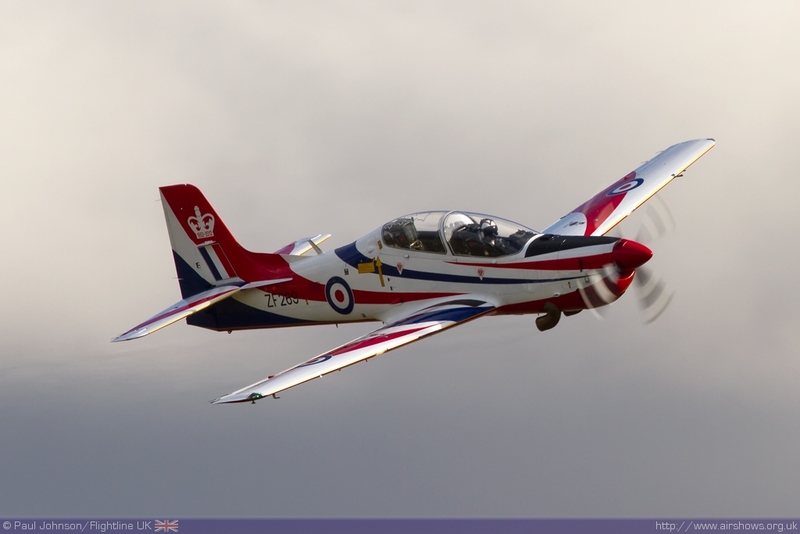 It was also a fond farewell to the 2012 RAF Hawk and Tucano solo display pilots. 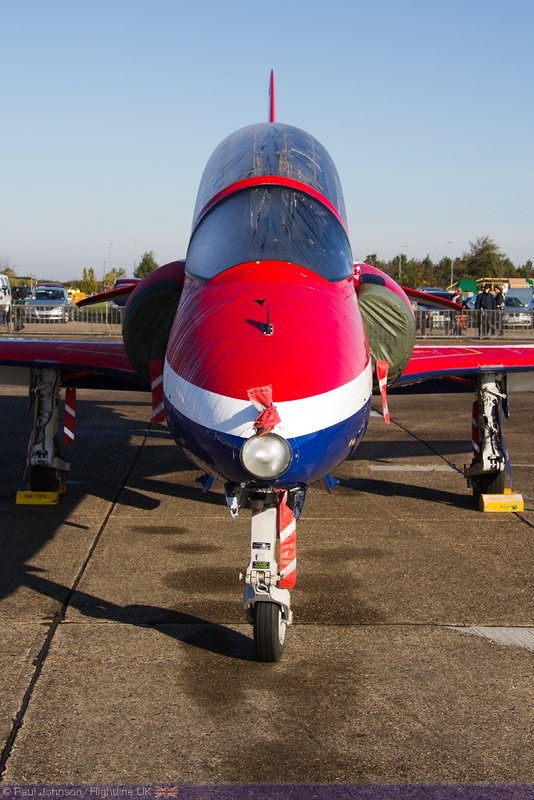 Both Flt Lt Phil Bird and Jon Bond have provided very well received displays throughout 2012 and to mark their final displays they provided the first (and last) public formation of the patriotic Hawk and Tucano display aircraft prior to their solo displays. 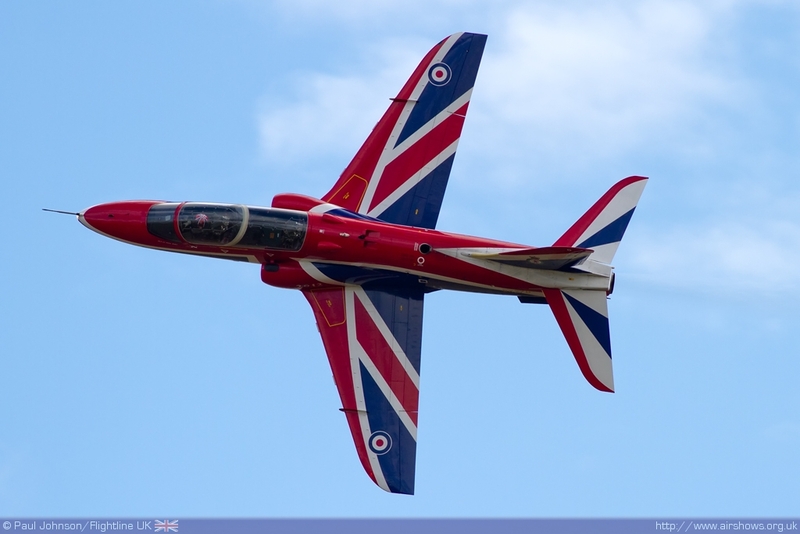 The more significant of the two displays was that given by the Hawk T1 which was appearing in a display as a solo display for the final time. 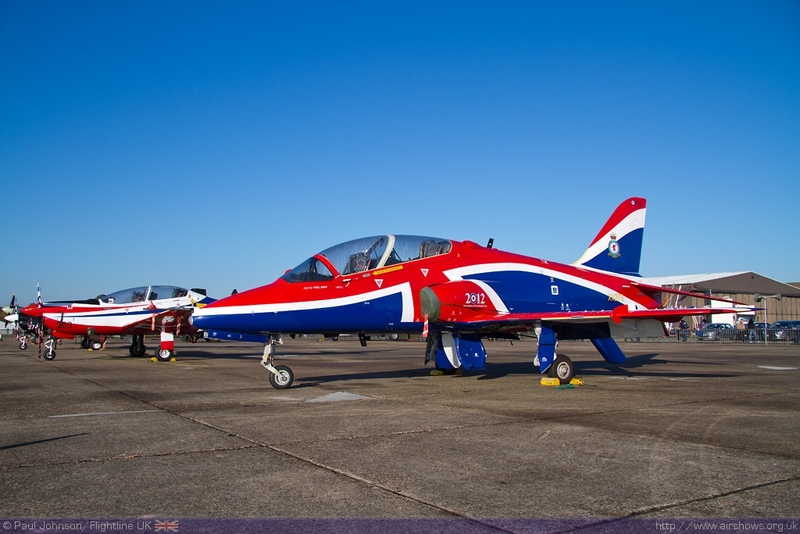 The T1s role as the advanced jet trainer for future RAF fast jet pilots is being passed over to the new Hawk T2s currently in service with IV(R) Squadron at RAF Valley. 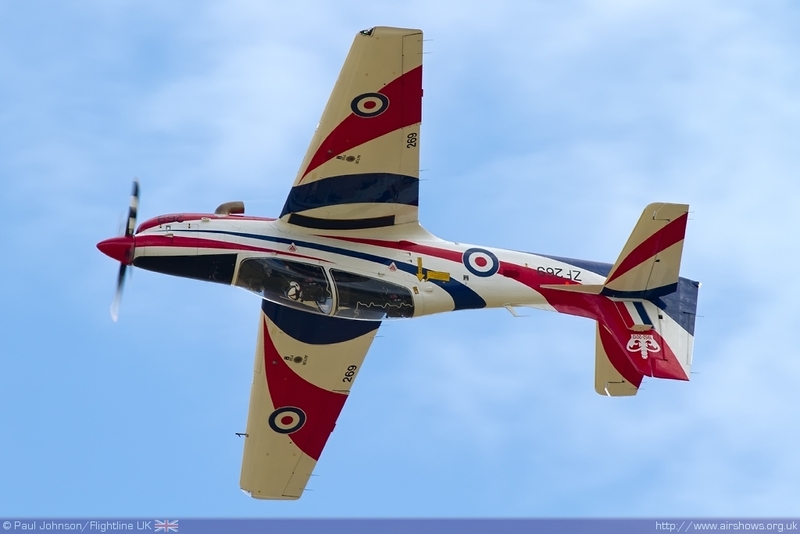 Sadly 2013 will be without a Hawk solo but it is hoped a Hawk T2 solo will be available in 2014. 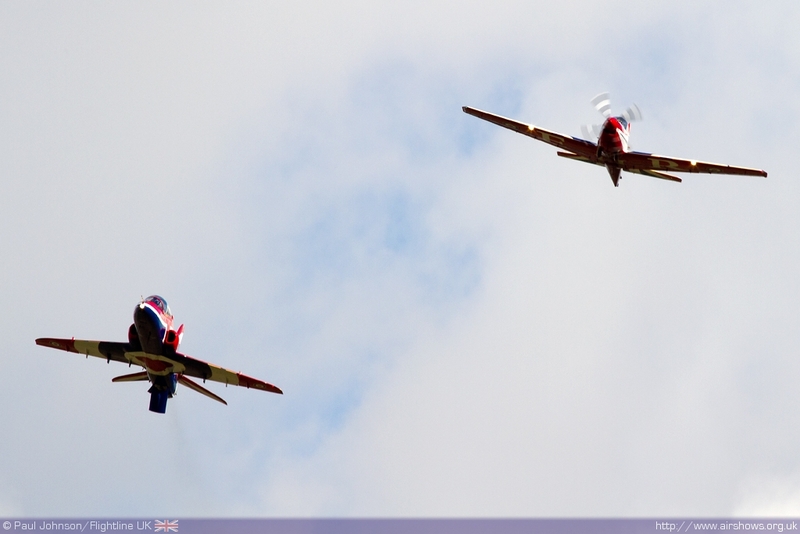 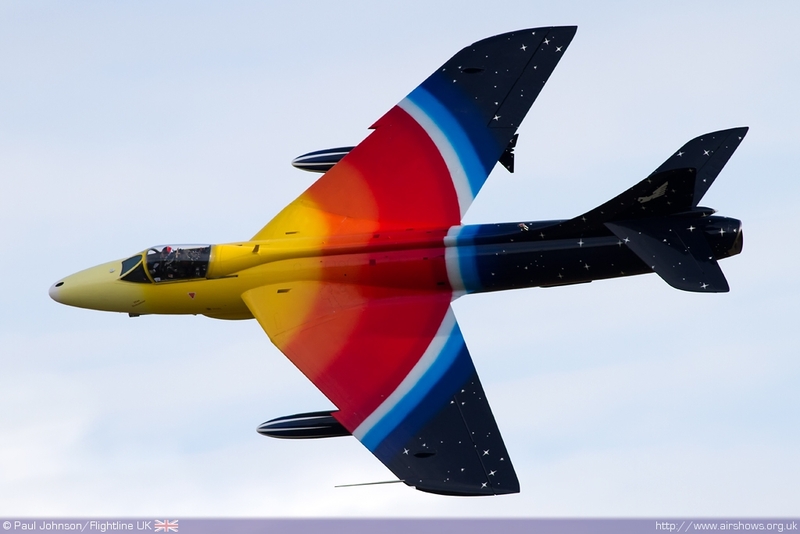 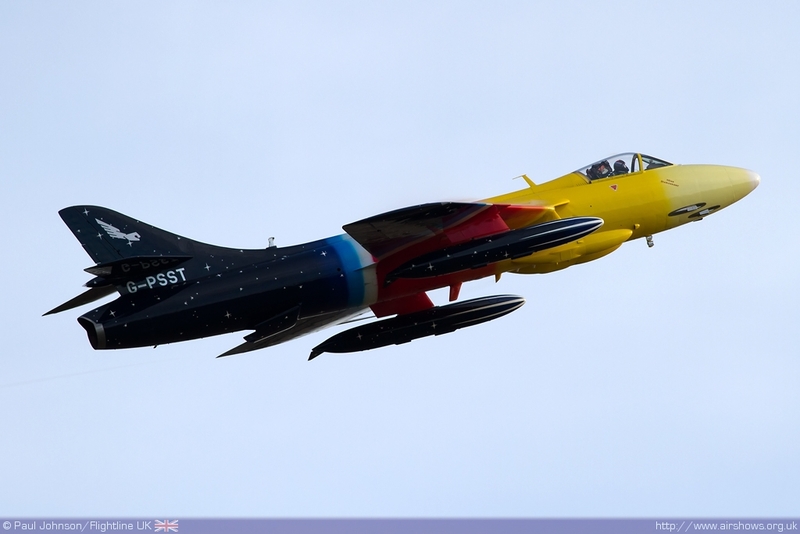 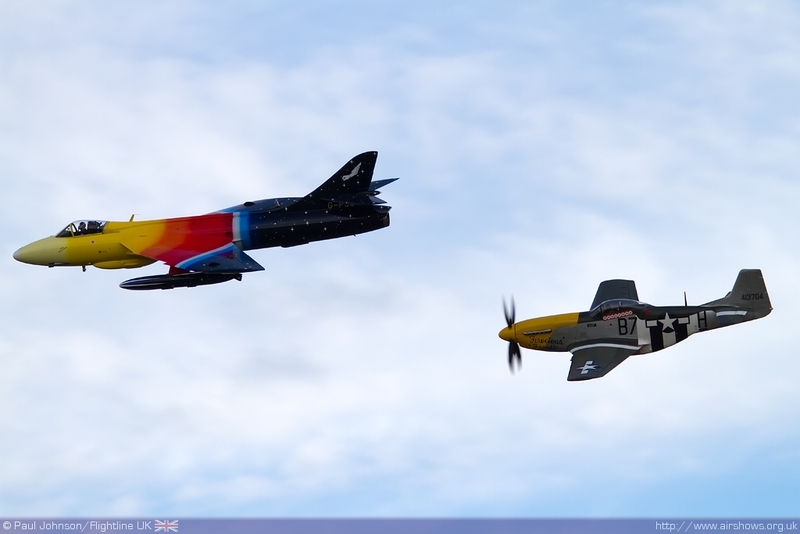 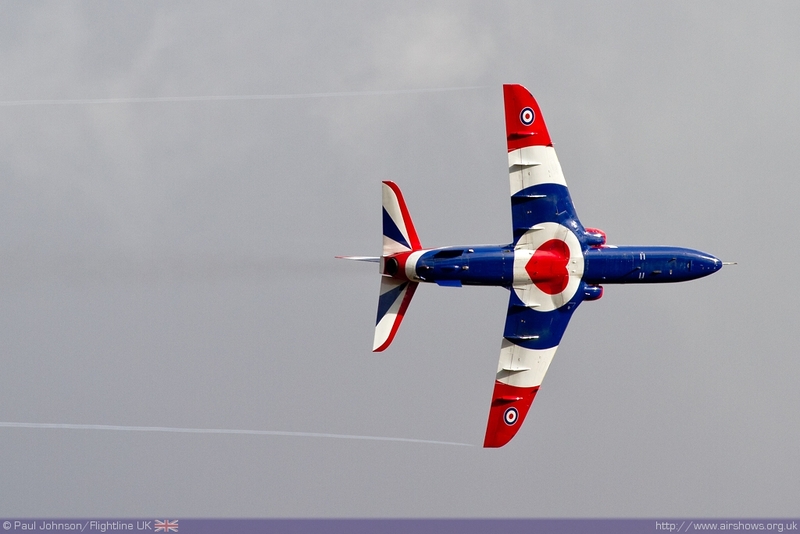 Further colour came from a pair of civilian aerobatic teams. 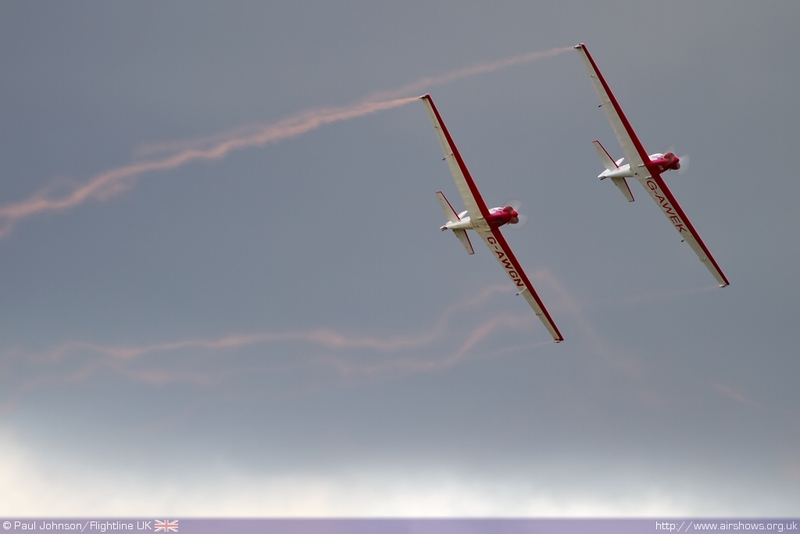 The RedHawks Duo of Bob Grimstead and Matthew Hill provided a superb graceful display of formation aerobatic in their Fournier RF4D motor-gliders. 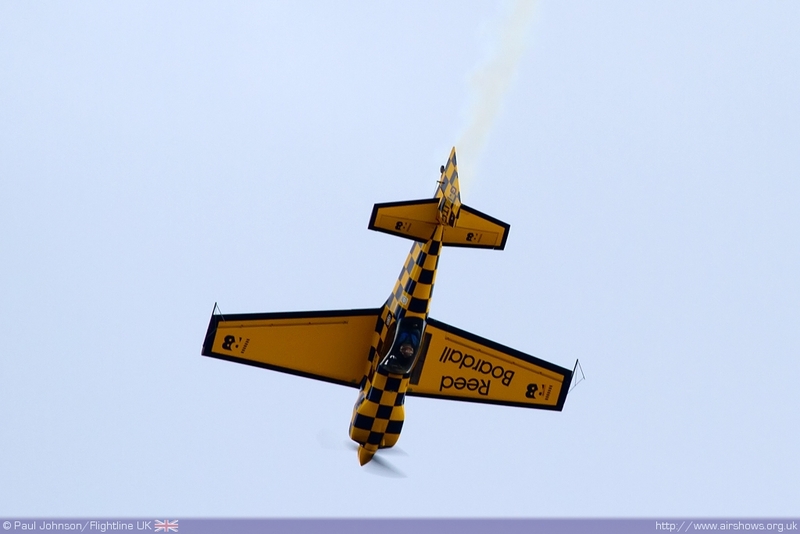 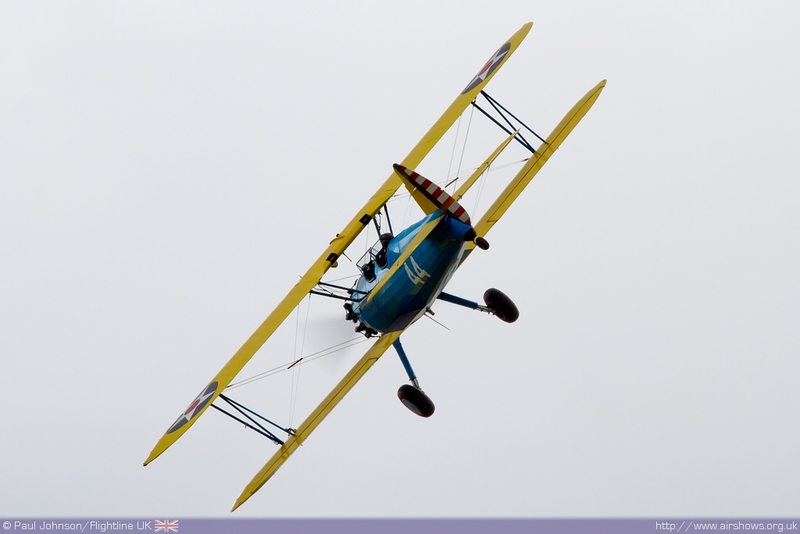 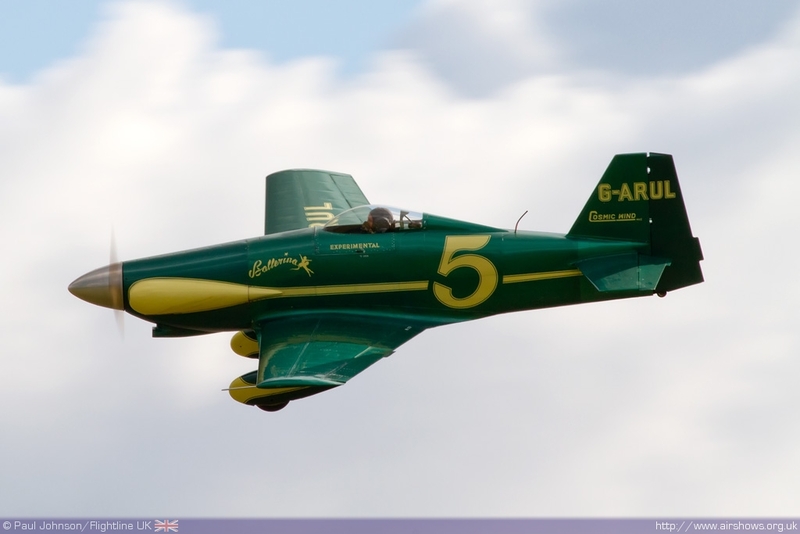 Much more pace was supplied by the TRIG Aerobatic Team with their bright yellow and purple Pitts S1D Specials. 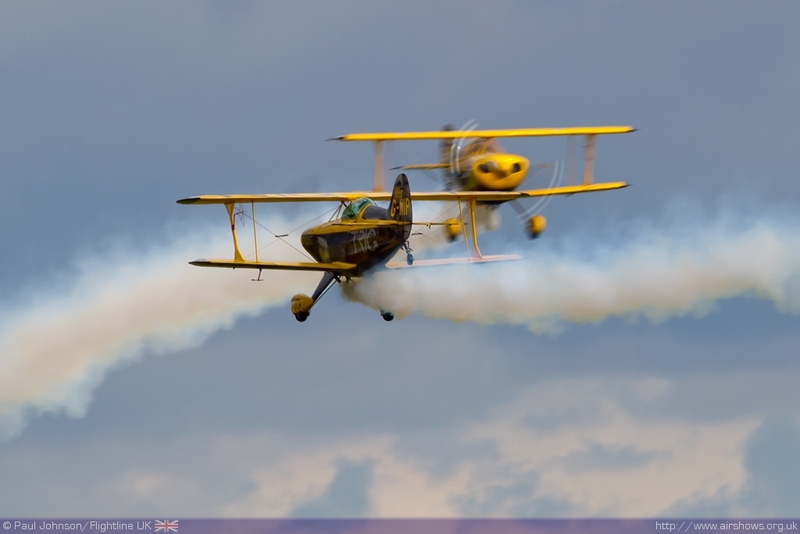 Richard Grace and Dave Puleston’s routine is a great mix of some close formation flying and daring opposition passes which a reminder of just what a good airshow and aerobatics machine the Pitts is. 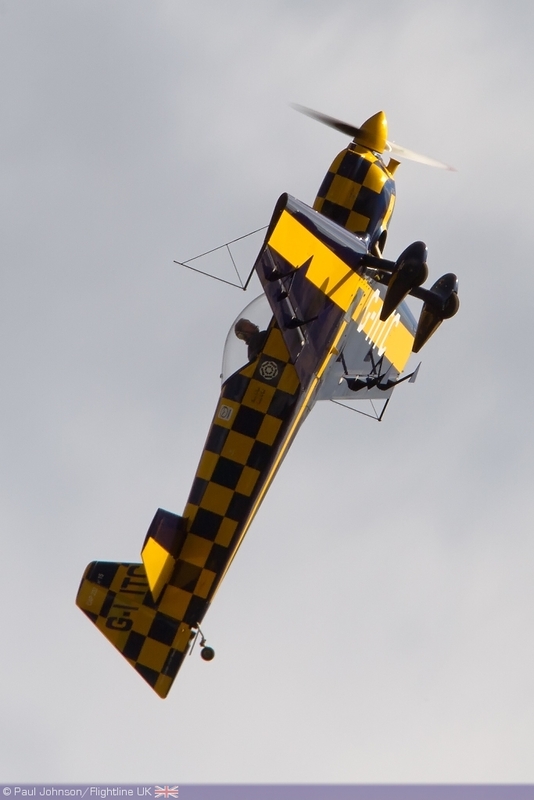 Bring the aerobatic story right upto date was Tom Cassells, a multiple UK aerobatic champion, flying the CAP232 and demonstrating just what a modern aerobatic machine is capable of. 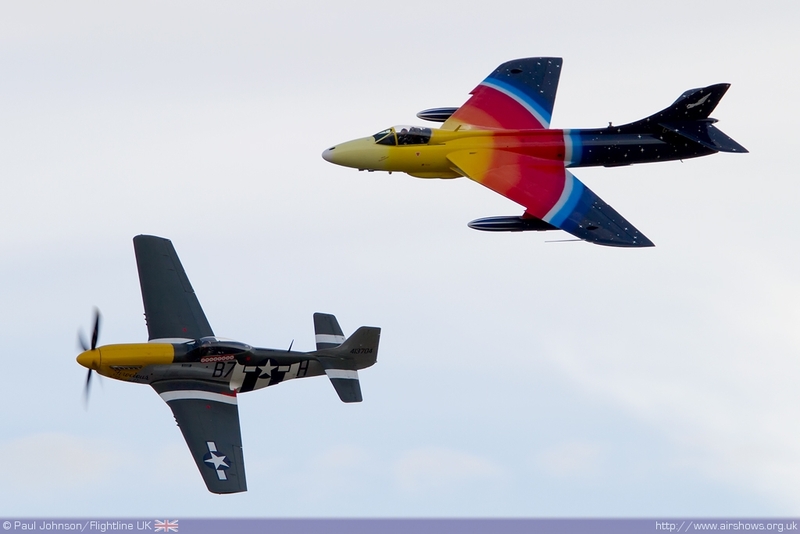 Duxford is of course famous for warbird action and the Autumn Air Show did not disappoint presenting a very wide cross section of different types. 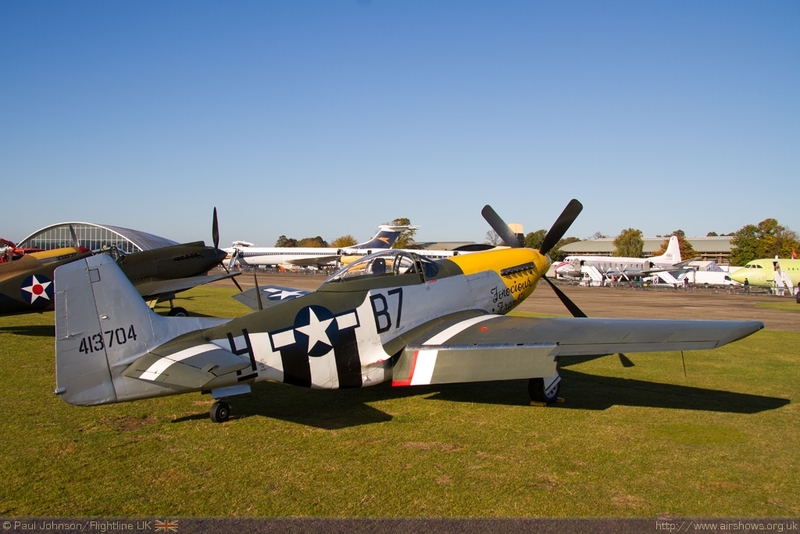 One of early set pieces looked at some of the types that may have been used to train P-51 pilots when they first joined the United States Army Air Force. 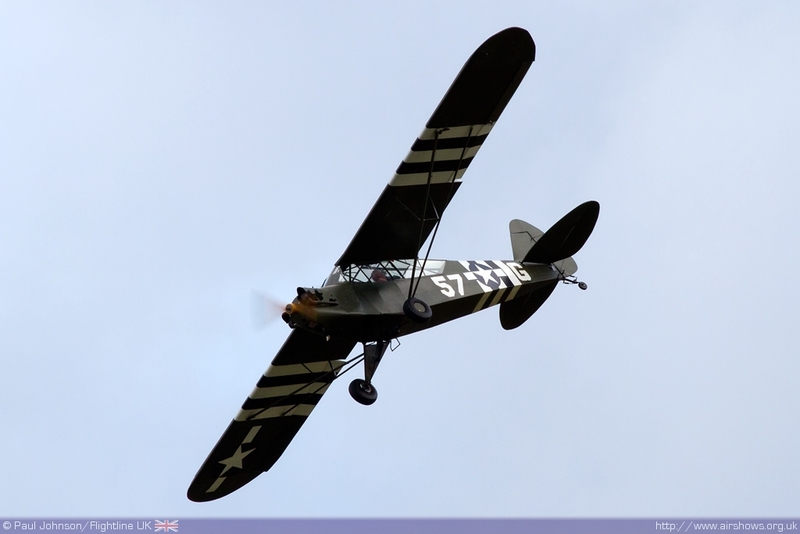 This saw Golden Apple’s Boeing PT-17 Stearman, Jeanne Frazer’s L4 Cub and the Fighter Collection’s North American Harvard fill the Duxford sky. 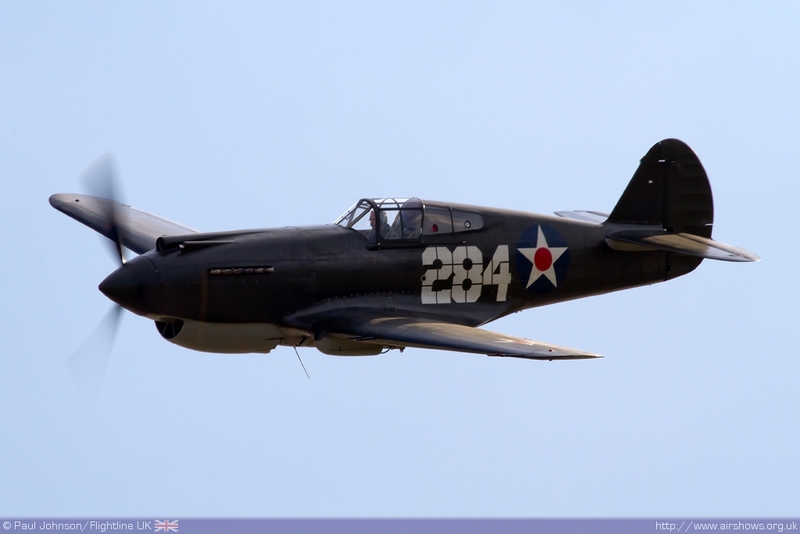 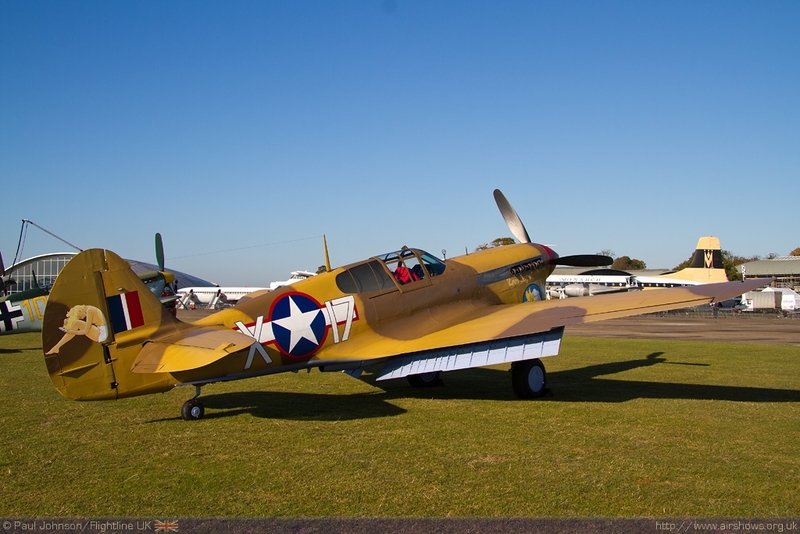 The Fighter Collection also provided its pair of Curtiss P-40 Warhawks flown by Dave Southwood and Alan Wade. 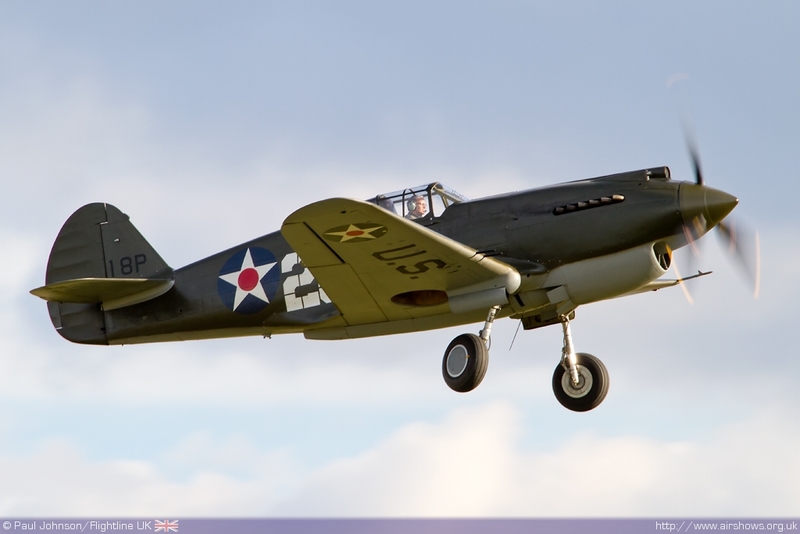 The TFC pair which flew a sweeping tail-chase included the early model P-40B that survived the Japanese attack on Pearl Harbour and the very rare Merlin powered P-40F Warhawk. 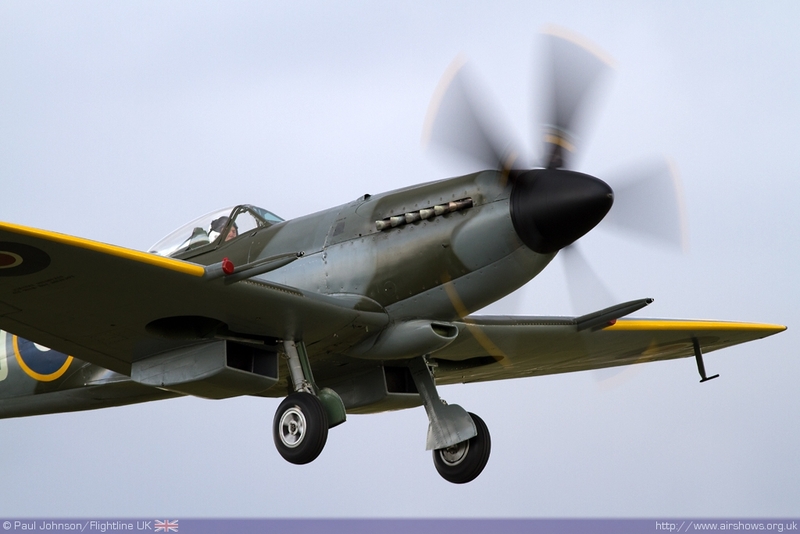 The early part of the Second World War was not forgotten either. 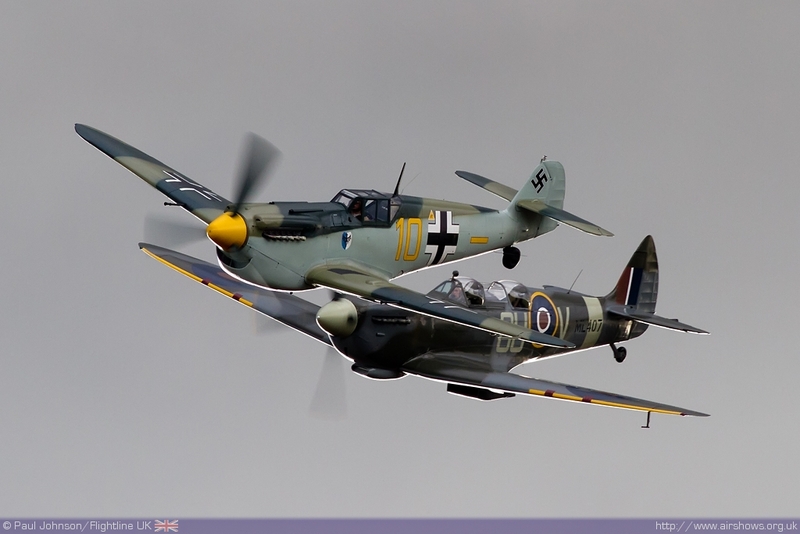 Pete Kynsey flew the Grace Spitfire IXT in close company with the Hispano HA1112MIL Buchon flown by John Romain through a tight aerobatic routine against a very dramatic dark cloudscape which passed over Duxford during their display. 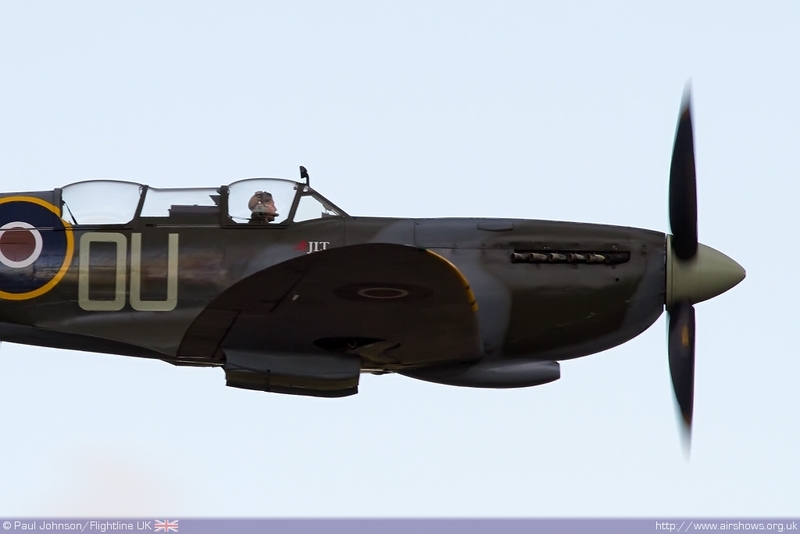 Sadly a further Spitfire XIV solo display by Stephen Grey had to be aborted due to some technical gremlins. 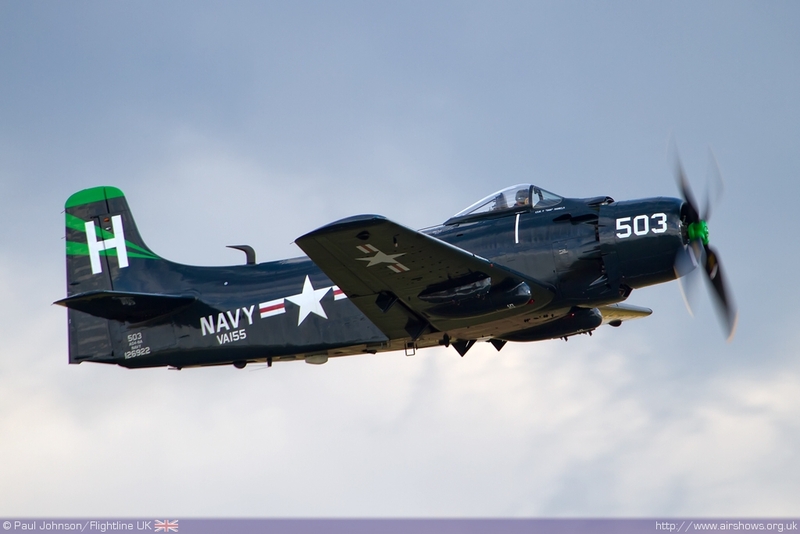 The only naval warbird to appear in the flying display this year was Kennet Aviation’s Douglas AD4N Skyraider flown by John Beattie. 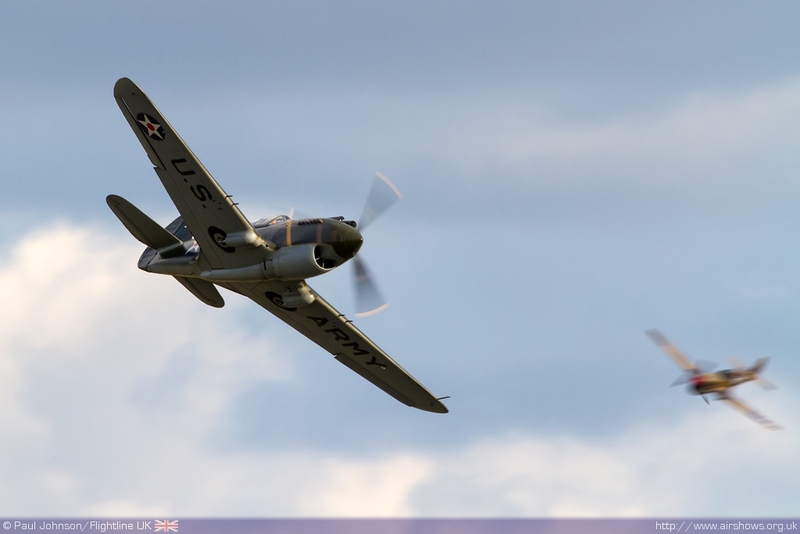 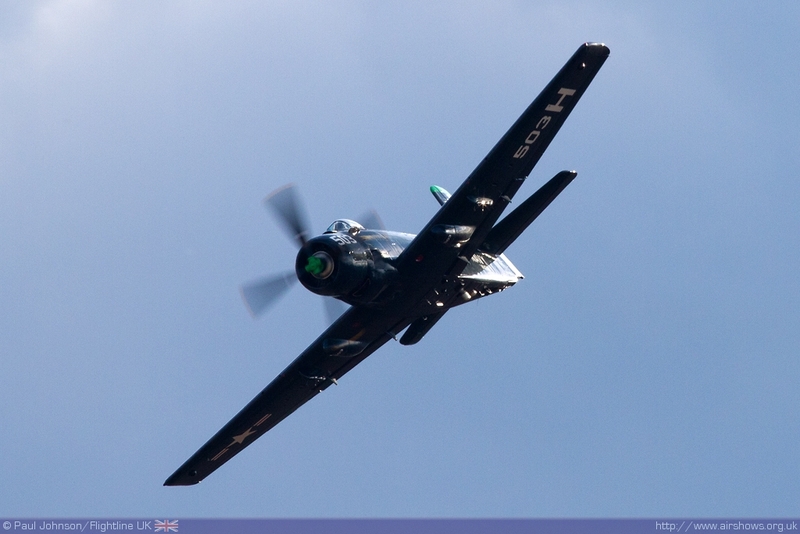 The Skyraider is always a great performer with great presence due to its growling radial engine and size. 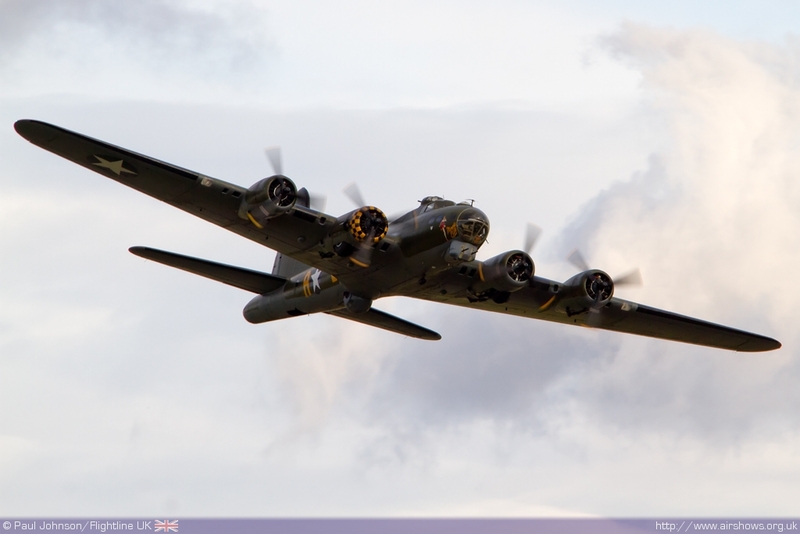 The American theme was continued by Duxford favourite Boeing B-17G Flying Fortress Sally-B. 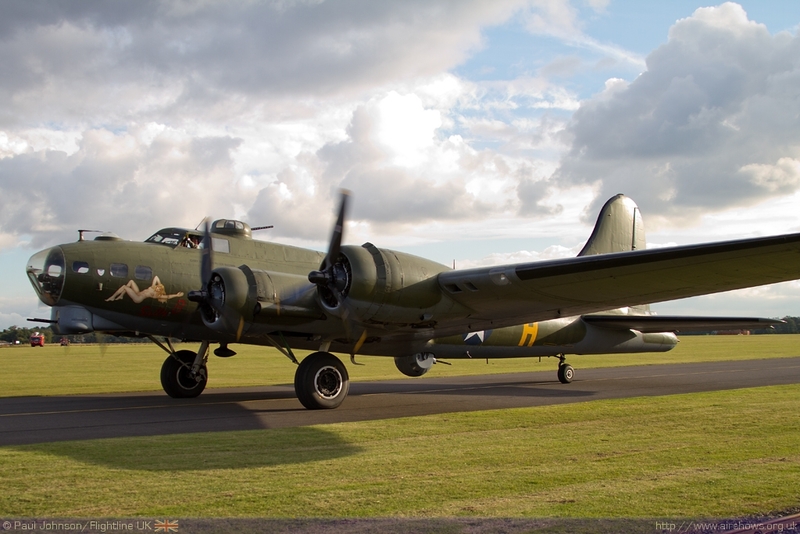 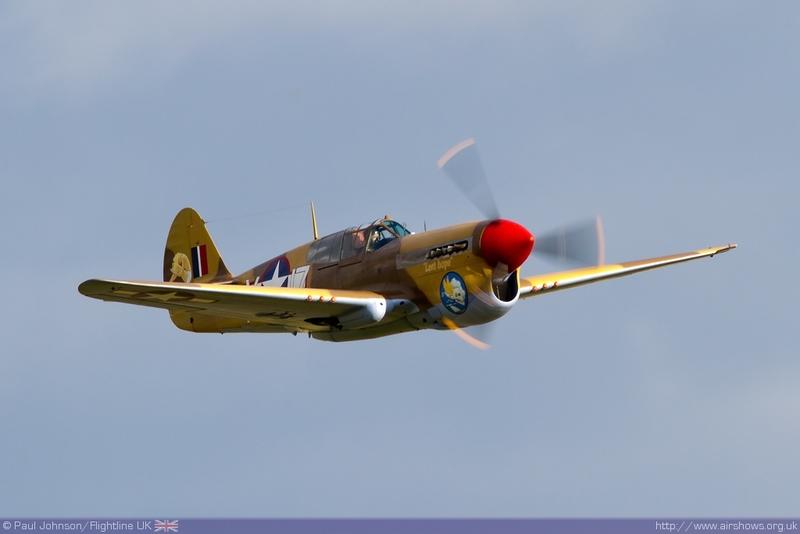 Sally-B has been a stalwart of the Duxford skies and the airfield’s airshows. 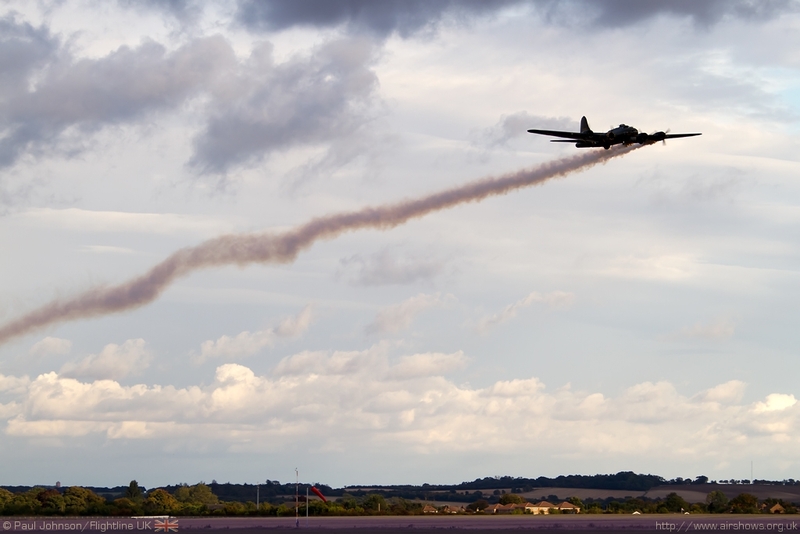 The B-17 opened the sequence which was dedicated to airshow commentator and display director. 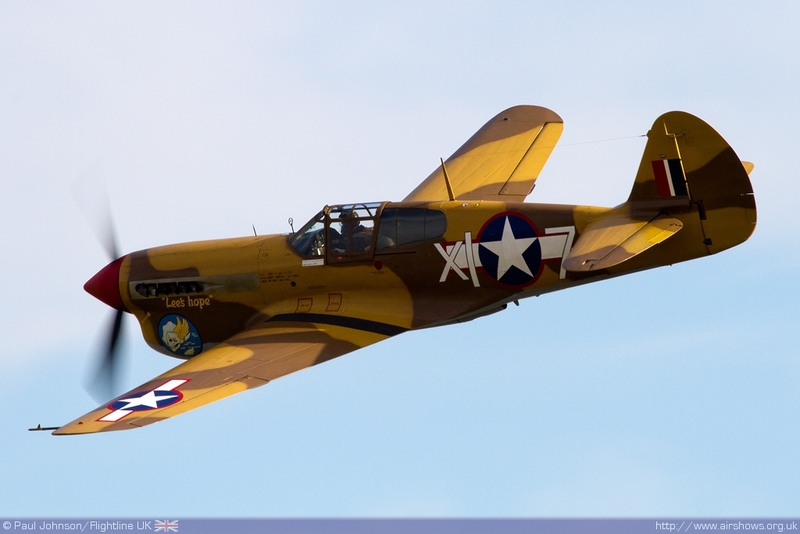 Peter was a great supporter of the B-17 and the combination of the bomber with the two P-51D Mustangs was a fitting tribute. 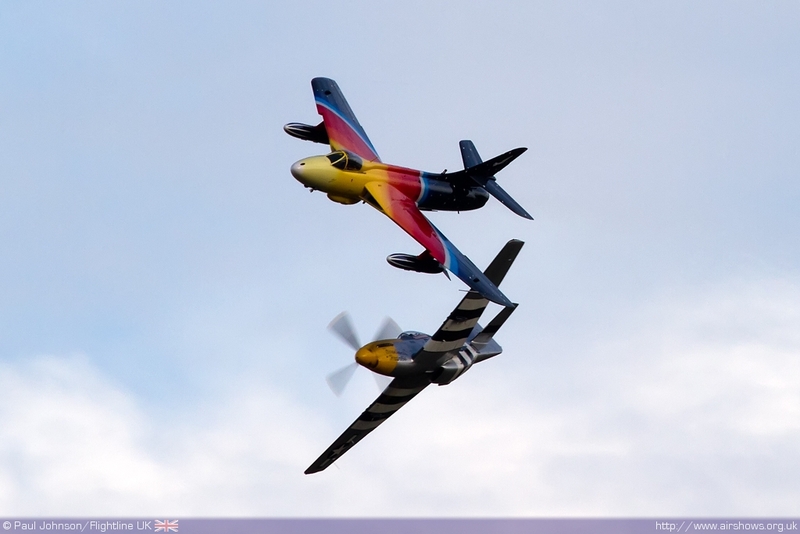 The salute to the Merlin powered P-51 may have been slightly low key with just two aircraft taking part, but the closing displays involving TFC’s TF-51D ‘Miss Velma’ and OFMC’s P-51D ‘Ferocious Frankie’ involved some of the best flying of the year. 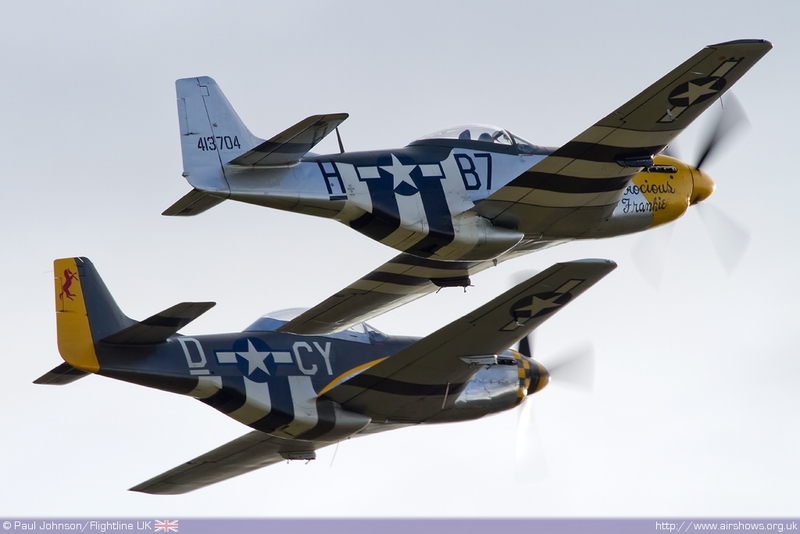 Both Mustangs perfomed together and as solo items with the distinctive Mustang whistle sounding out over Duxford. 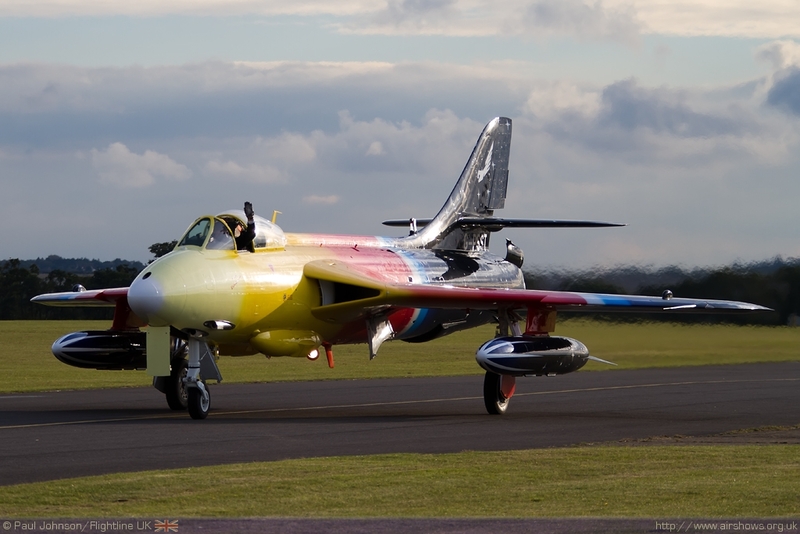 It was however the final special formation of the day that was the true highlight with Alister Kay in ‘Ferocious Frankie’ forming up with the Hawker Hunter F58a ‘Miss Demeanour’ flown by Jonathon Whaley. 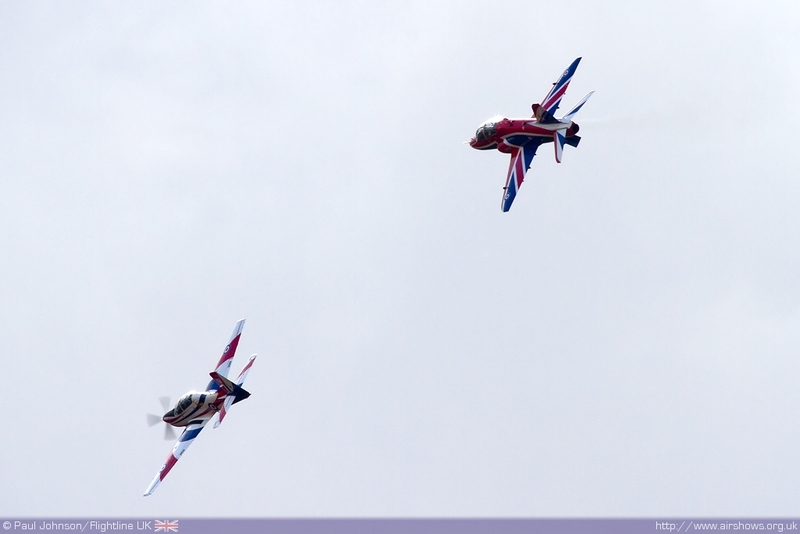 The two aircraft flew five passes sharing the role of leader before a final spectacular break at crowd centre. While the Mustang landed, Jonathon went on to perform his usual stunning solo routine in the Hunter to bring the 2012 Airshow Season to a close in style in the low autumnal sunshine. While the show did not see the debuts or international performers previous editions of the Autumn Air Show may have seen, it did bring the UK airshow season to a close with some great flying in relaxed style. 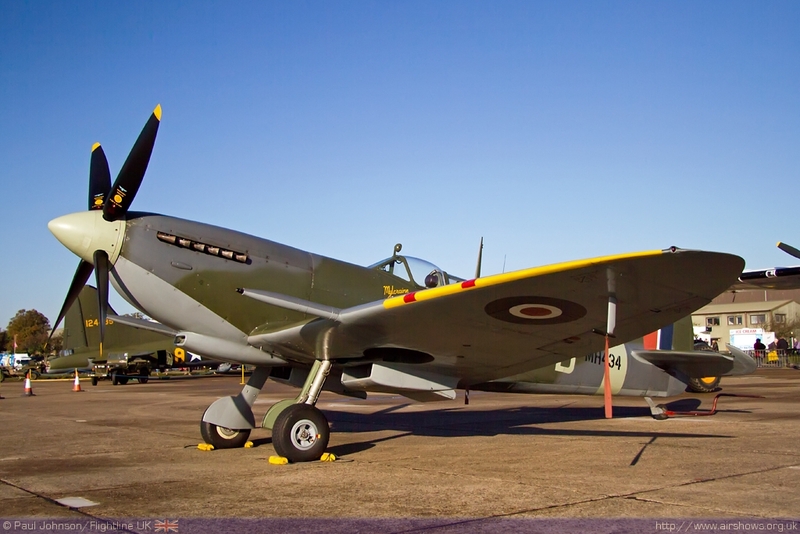 Duxford’s 2013 airshow season gets underway on the 26th May 2013 and we hope it can be as entertaining and successful as 2012.